Here at Nuking Politics we are awesome. It's ok to admit it because everybody already knows it anyway. We are incredibly intelligent and educated and our opinions are always right. Always. With that being said, every so often we find it necessary to wield the "Grammar Hammer". Once in a great while, one of our brilliant bloggers makes a spelling or grammatical error. On normal blogs that would be tolerated, and perhaps even embraced. Our standards are such that when something so....heinous.....as a misspelled word or poorly constructed sentence is encountered....it is just not allowed. It must be discovered...wherever it is hiding....and it must be ANNIHILATED. 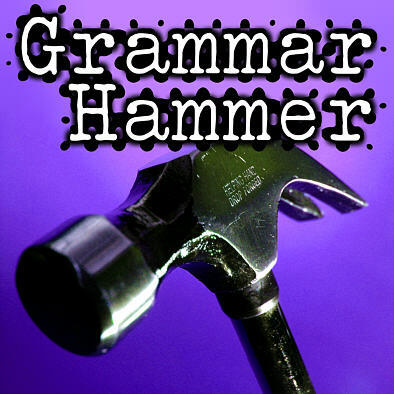 The "Grammar Hammer" is perfectly adapted for this purpose, and is our weapon of choice. We believe our readers have the same level of smarts as we do...otherwise they wouldn't understand a thing we were saying and they'd leave. Or they'd disagree and they'd leave. Either way, if they were stupid they wouldn't be around here for long. So, it makes sense that, if necessary, we bring out the "Grammar Hammer" on our readers' comments as well. You guys are smart. Just remember that when you write. Oh, noes! A NUCULAR grammer hammar!!! That hammer ain't nearly forbidding enough. I haven't even lost control of a single faculty. It actually makes me want to turn off my spell checker and see what happens. Paragraphy 5 you said "Grammer Hammer" instead of "Grammar Hammer". And thus, the wielder of the Grammar Hammer becomes the first to fall victim to its unyielding power. Like the French Revolution, except less bloody and a good deal funnier.